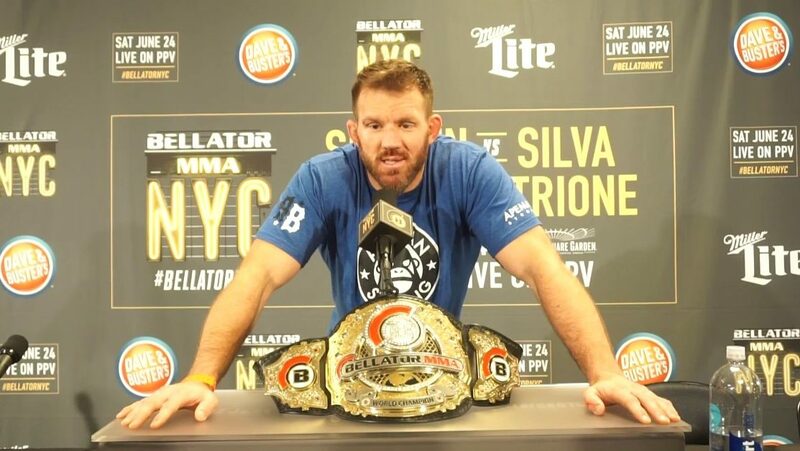 After needing only 35 seconds to become the first double champion in Bellator MMA history, Ryan Bader is not looking to leave the brand. Speaking with Ariel Helwani on Monday, the current Bellator heavyweight and light heavyweight champion has no interest in testing free agency or returning to the UFC. “No, I want to do a new deal now. I have one fight left, I have the champion’s clause or whatever, in my contract. Two-division champion, light heavyweight belt, heavyweight belt; if they want me to do something in particular, defend the heavyweight belt or whatnot. Let’s get a new deal done. I have been having a great time with Bellator and I want to stay there. But that has to happen first,” the dual champion said. Bader has gone 5-0 in Bellator after eight years fighting for the UFC, and in that time has not only won the light heavyweight title, but run through the Bellator Heavyweight Grand Prix and knocking out Fedor Emelianenko at Bellator 214. “It’s a selfish sport and you are in business for yourself. Obviously I have been treated well and I think I am going to be treated very well after this with Bellator. I haven’t really had those thoughts,” Bader said of walking back over to the UFC. While Tito Ortiz and Chael Sonnen could end up returning to face Bader at 205 pounds, the doors are open at heavyweight as well depending on how things break out over the next few months.